We always have the same teacher, Laurence Fauvel, so you can imagine how much she influences our experience. Laurence is great. Apart from her expertise, she is also funny, kind, generous and seems to always find the right balance between guidance and freedom to create. During these days we get access to so many parts of the perfume world, it’s not only the never-ending raw materials but also practical details about the working process for a professional perfumer or evaluator and about the business. 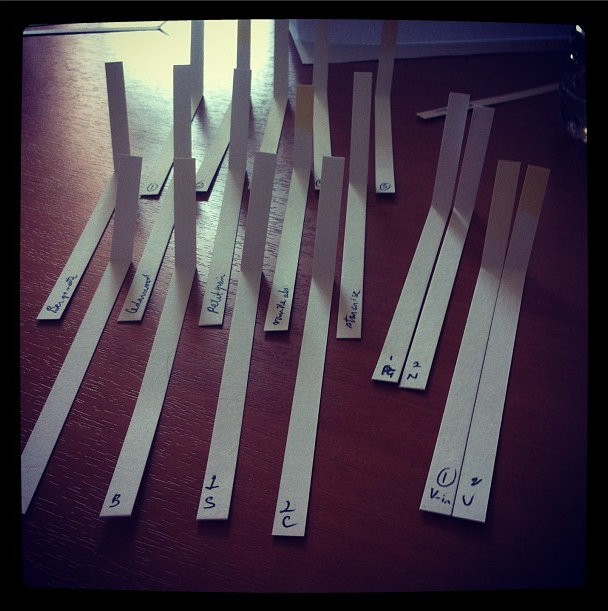 An example of a day at school (for new readers: I am talking about the summer course at Grasse Institute of Perfumery) is that we start with a test. 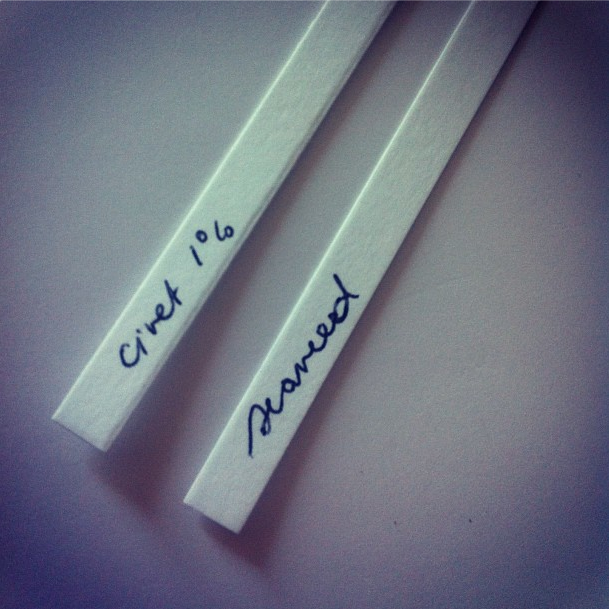 This means that Laurence gives us ten raw materials (can be both natural and synthetic) on paper strips and we have to conclude which ones they are. We have our noses of course, but at our stage it is also essential to have good notes for example to remember how to separate the natural lavender from the synthetic lavandine or the various citrus fruits. It is still quite often that we mix some specific ones up when they come on a separate strip – but when you get two strips with one on each it usually seems obvious which one is which. This is an example why the notes are important – there is always some difference and there might be a tiny detail that is a personal reflection and this will help you remember. I love the tests, they are a moment to really go deep into detailed perception and cherish the nuances of things. And you know how I feel, perfume is like life, life is like perfume. During the test I also think we stimulate our curiosity through new discoveries while at the same time discovering some personal preferences. It is very interesting how previous experiences and memory affect the initial reaction to a new smell – for example we had seaweed in a test. For me it reminded me of a bath room on a beach, for someone else a pleasant walk on a beach and for another person it was a smell related to food. When we exchange associations in class we can approach the materials from new perspectives and rediscover them. I read a book by Rachel Herz before Grasse about olfactory psychology where there are many interesting things about this – I will write a separate post on this when I come home. Some notes instantly feel so inspiring every time they appear under the nose. Vetiver makes me want to go straight to the lab and experiment. I love cedarwood and petitgrain and ambroxan (I still have not smelled real ambergris, this is becoming a life mission!). I have less spontaneous affection for many florals and more for spices and woods. Also I often feel a preference for most naturals even though understand and appreciate the possibilities that synthetics offer. But for example vanilla and vanillin… you do get a very rewarding instant softness with vanillin, but real vanilla has so much more integrity and nuances and is unruly. The naturals always feel a bit unruly and I love that. Again, perfume and life. After the test we smell more, for example we compare naturals to corresponding synthetics or notes that we find it more difficult to separate. 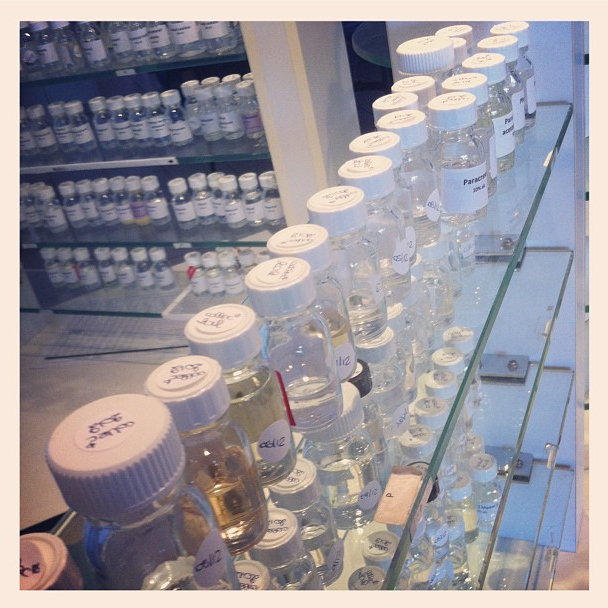 We have also analyzed popular perfumes that are on the market which is great fun under the guidance of Laurence. We have spent two afternoons on creation during the last week and this has been just amazing really. Some in the group have made formulas before but for me the entire situation was new – from pipettes to counting grams. The idea part however felt very natural, I have been walking around with note combinations in my head for a long time but never had the opportunity to physically sit down and create them. Even on our very very basic level it is an extra-ordinary experience to have an idea in your head, smell the raw materials in our bottles and then get to actually make a formula trying out the right proportions (very small quantities make a very big difference) and make it. 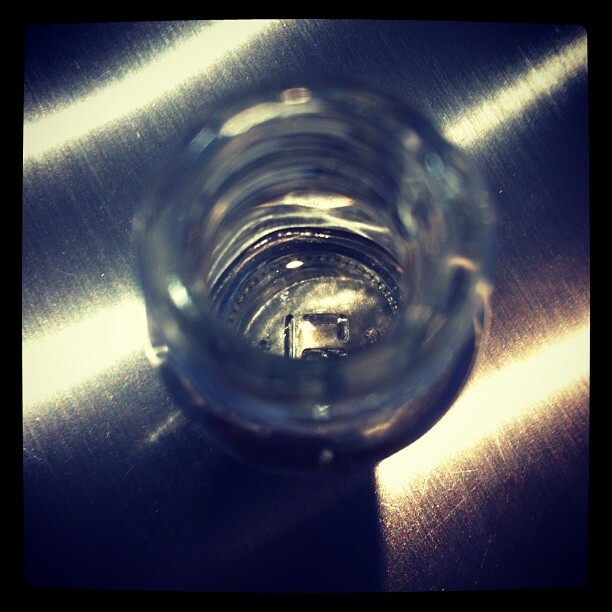 This week our two creations were an eau de cologne and a fougère. Laurence gave us a base and then we could add raw materials with her guidance regarding amounts. To find the exact proportions is really a challenge and it is an intricate adventure to predict how the formula will evolve. At this point it astounds me how a perfumer can orchestrate the notes with the precision that some masters do and control the transitions over time. I will tell you more about on of my creations in a separate post. At the end of this day we have an evaluation where everyone smells everyone’s creation and we discuss and get feedback and advise from Laurence. At this point we have been at school for about eight hours. Normally at the end of a day I would be a bit tired and want to go home. Here I keep finding myself thinking “oh, now I have to wait to tomorrow to smell more…”. I am very happy in this experience that I am having right now.